Luton Town were honoured at the EFL awards held at Grosvenor Hotel in London on Sunday night. Town striker James Collins was named as the EFL League One Player of the Season, while James Justin earned selection for the EFL Team of the Season. Both Collins and Justin were both in the League One Team of the Year, along with right back Jack Stacey. Justin missed out on the EA EFL Young Player of the Year award, that one going to former Crawley Green and Hatters’ youngster Max Aarons, currently with Premier-League bound Norwich City. Speaking at the event, Aarons had said: “I’m delighted, I couldn’t ask for more. Also in attendance was Pelly-Ruddock Mpanzu, up for the Goal of the Year award, for his stunner against Crewe last season, the prize taken by Wolves’ Ruben Neves as a result of everyone in the room voting on the night. Town’s top scorer Collins, who has netted 22 goals this term, beat Doncaster’s John Marquis and Sunderland’s Aiden McGeady to the accolade. Speaking about the honour, he said: “Obviously this is a really proud moment for me personally. “It’s been a great season so far both personally and for the team. Justin, who has had a superb campaign for the Hatters, tweeted: Great night at the EFL Awards, delighted to be involved in the EFL Team of the Season. Prior to the awards night, Mpanzu had admitted he was heading more in hope than expectation. He said: “It’s good to get voted for anything, especially goal of the year. “I can’t lie, I probably won’t win, John McGinn’s, it’s a great goal, I think I would vote for him. 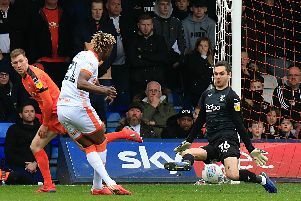 Finally, club legend Ricky Hill took to Twitter to say: “Congratulations to all of the @LutonTown nominees and awardees.